Drawing his creative strength from his Algerian roots and the Mediterranean culture, Compagnie Hervé KOUBI is a new and promising player on the international touring circuit, combining contemporary and urban dance movements, capoeira, martial arts with powerful imagery and inspired choreography, defying gravity. The company made its US debut in October 2015 at the 12th annual edition of New York's City Center Fall for Dance Festival, before touring since then and extensively to sold out theaters with standing ovations in San Francisco, Portland/OR, Boston, Worcester/MA,Houston, Dallas, Tulsa/OK as well as the world known Jacob's Pillow Dance Festival. KOUBI has also collaborated with several video projects and is regularly invited as a guest teacher by various professional dance schools such as the Rosella Hightower School of Dance in Cannes, elsewhere in France as well as in other countries. The company receives financial support in France from the Limousin and PACA (Provence Côte d'Azur) regions, the cities of Brive and Cannes as well as from the French Embassy in Algeria and the Institute Français for selected international touring projects. 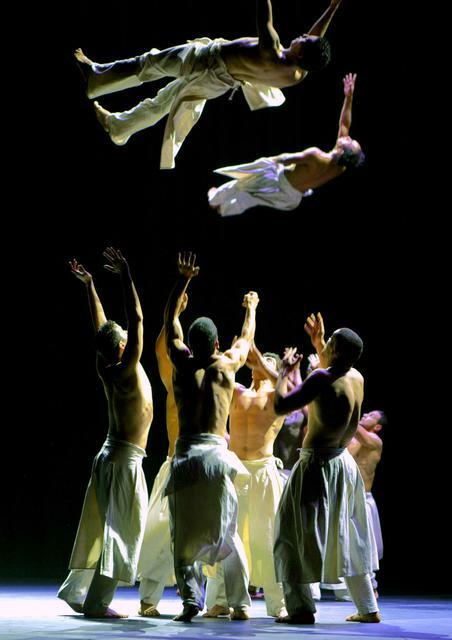 KOUBI's latest major choreography projects which he developed during 2010-2013 with an all male cast of dancers from West Africa and primarily Algeria, include El Din and more recently What The Day Owes To The Night. Both have helped him connect with his own Algerian roots, having also toured extensively throughout France including at Paris' Centre National de la Danse and developed residency partnerships with Ecuador, Mexico, Palestine, Algeria, Russia and Canada. Menagerie (2002) and various other projects with live music, outdoors on Cannes's world renown Croisette promenade as well as inspired by contemporary writing essays. In 1999, KOUBI joined the National Choreography Center of Nantes, directed by Claude Brumachon and Benjamin Lamarche, where he helped develop the choreography of Hotel Central. Of Algerian roots, Hervé KOUBI grew up in the South of France where he studied both biology and dance at the University of Aix-en- Provence before graduating as a Pharmaceutical Doctor. After deciding to concentrate on a dancing career and graduating from the world renown Rosella Hightower School of Dance in Cannes, KOUBI gained professional experience as a dancer with the Opera de Marseille as well as with Jean-Charles Gil and Jean- Christophe respectively former principal dancers with the National Ballet de Marseille and the Paris Opera Ballet, on the development of new contemporary dance projects. ​In addition to its extensive European touring in France for several years, the company's 16/17 season will feature a total of 65 performances in both Europe and North America with return and new engagements in TX, CA, FL, AR, WA, HI as well as in Canada, in both Vancouver and Ottawa during two separate tours scheduled for January and Spring 2017. Whereas the European touring features performances of What The Day Owes Too The Night and KOUBI'S new 12 dancer The Barbarian Nights on music by Wagner, Faure and Mozart with traditional Algerian sounds, the company is planning to tour both works in North America during the 17/18 season on three separate periods including during Summer 2017. In July 2015, choreographer Hervé KOUBI was awarded the French medal of Chevalier des Arts et des Lettres by Brigitte Lefevre, the former Artistic Director of the Paris Opera Ballet.